Beyond the Solar System’s Main Asteroid Belt lies the realm of the giants. It is here, staring with Jupiter and extending to Neptune, that the largest planets in the Solar System are located. Appropriately named “gas giants” because of their composition, these planets dwarf the rocky (terrestrial) planets of the inner Solar System many times over. Just take a look at Saturn, the gas giant that takes its name from the Roman god of agriculture, and the second largest planet in the Solar System (behind Jupiter). In addition to its beautiful ring system and its large system of moons, this planet is renowned for its incredible size. Just how big is this planet? Well that depends on what your frame of reference is. First let’s consider how large Saturn is from one end to the other – i.e. it’s diameter. 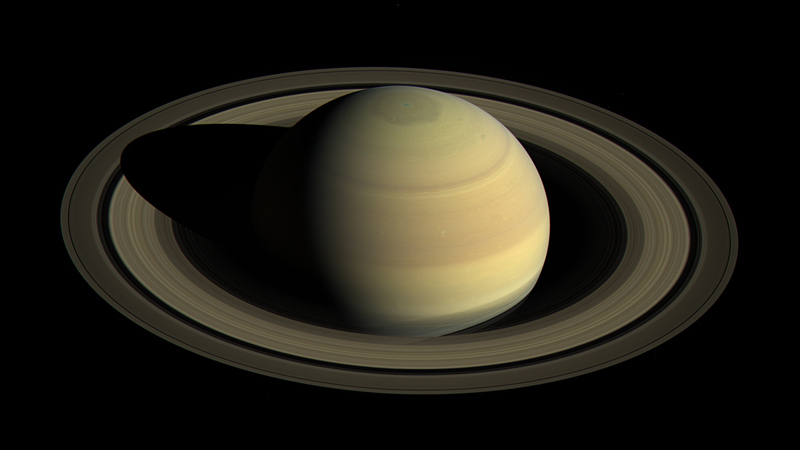 The equatorial diameter of Saturn is 120,536 km ± 8 km (74,898 ± 5 mi) – or the equivalent of almost 9.5 Earths. However, as with all planets, their is a difference between the equatorial vs. the polar diameter. This difference is due to the flattening the planet experiences at the poles, which is caused by the planet’s rapid rotation. Like all the giant planets, Saturn is many times the size of Earth and the other rocky planets. Credit: NASA/JPL-Caltech/Space Science Institute. The poles are about 5,904 km closer to the center of Saturn than points on the equator. As a result, Saturn’s polar radius is about 108,728 ± 20 km (67,560 ± 12 mi) – or the equivalent of 8.5 Earths. That’s a pretty big difference, and you can actually see that Saturn looks a little squashed in pictures. Just for comparison, the equatorial diameter of Saturn is 9.4 times bigger than Earth, and it’s about 84% the diameter of Jupiter. In terms of volume and surface area, the numbers get even more impressive! For starters, the surface area of Saturn is 42.7 billion km² (16.5 billion sq miles), which works out to about 83.7 times the surface area of Earth. That’s smaller than Jupiter though, being only 68.7% of Jupiter’s surface area. Still, that is pretty astounding when put into perspective. On the other hand, Saturn has a volume of 827.13 trillion km³ (198.44 trillion cubic miles), which effectively means you could fit Earth inside of it 763 times over and still have room enough for about twenty Moons! Again, Jupiter has it beat since Saturn has only 57.8% the volume of Jupiter. It’s big, but Jupiter is just that much bigger. What about mass? Of course Saturn is much, much, MUCH more massive than Earth. In fact, it’s mass has been estimated to be a whopping 568,360,000 trillion trillion kg (1,253,000,000 trillion trillion lbs) – which works out to 95 times the mass of Earth. Granted, that only works out to about 30% the mass of Jupiter, but that’s still a staggering amount of matter. Looking at the numbers, you may notice that this seems like a bit of a discrepancy. If you could actually fit 763 Earth-sized planets inside Saturn with room to spare, how is it that it is only 95 times Earth’s mass? The answer to that has to do with density. Since Saturn is a gas giant, its matter is distributed less densely than a rocky planet’s. Whereas Earth has a density of 5.514 g/cm³ (or 0.1992 lb per cubic inch), Saturn’s density is only 0.687 g/cm3 (0.0248 lb/cu in). Like all gas giants, Saturn’s is made up largely of gases that exist under varying degrees of pressure. Whereas the density increases considerably the deeper one goes into Saturn’s interior, the overall density is less than that of water – 1 g/cm³ (0.0361273 lb/cu in). Yes, Saturn is quite the behemoth. And yet, ongoing investigations into extra-solar planets are revealing that even it and its big brother Jupiter can be beaten in the size department. In fact, thanks to the Kepler mission and other exoplanet surveys, astronomers have found a plethora of “Super-Jupiters” in the cosmos, which refers to planets that are up to 80 times the mass of Jupiter. I guess the takeaway from this is that there’s always a bigger planet out there. So watch your step and remember not to throw your weight (or mass or volume) around! We have written many articles about Saturn for Universe Today. Here’s Ten Interesting Facts About Saturn, The Orbit of Saturn, how Long is a Year on Saturn?, What are Saturn’s Rings Made Of?, How Many Moons Does Saturn Have?, What’s the Weather Like on Saturn?, and What is the Atmosphere Like on Saturn? 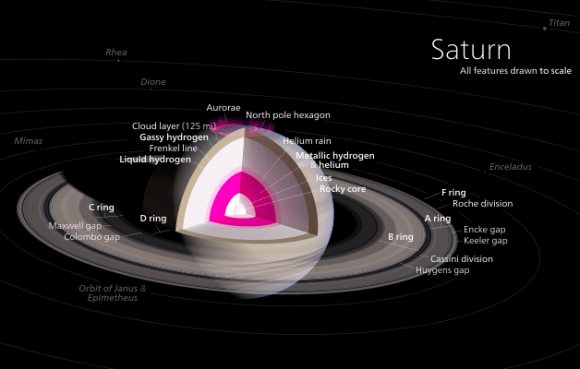 We have also recorded an entire episode of Astronomy Cast all about Saturn. Listen here, Episode 59: Saturn. I am curious. Since the gas giants are gas, how do you determine how big they are? Just as on earth I am sure the atmosphere continues into space for dozens, or hundreds of miles, just not as thick. Do you stop when the gas thins to one earth atmosphere at sea level? You should point out that the “surface” of a gaseous planet is considered to be the surface of a sphere where the atmospheric pressure is equal to 1 atm (about 1bar).